It was balmy, warm and threatening rain when festival artistic director Adrian Jackson welcomed patrons to the first gig of this festival, the Linda Oh Quartet. This group, with Sam Sadisgursky on tenor sax, Fabian Almazan on piano and Rhodes and Kendrick Scott on drums, played with zest, energy and interaction. 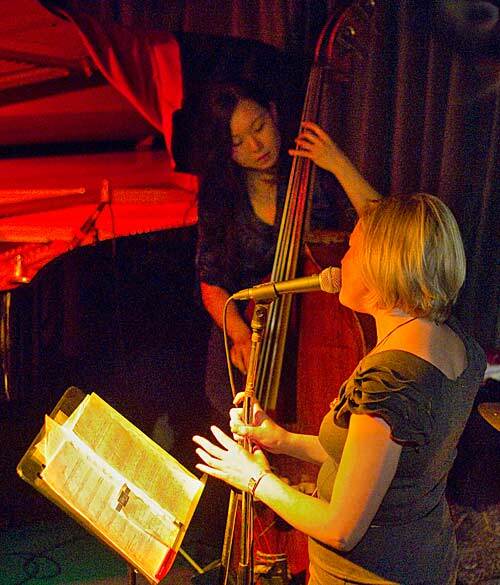 Oh, who moved from Malaysia to Perth when she was two and now lives in New York, was a hit on her previous visit to Wangaratta, but her approach to the music then was cooler and less relaxed. 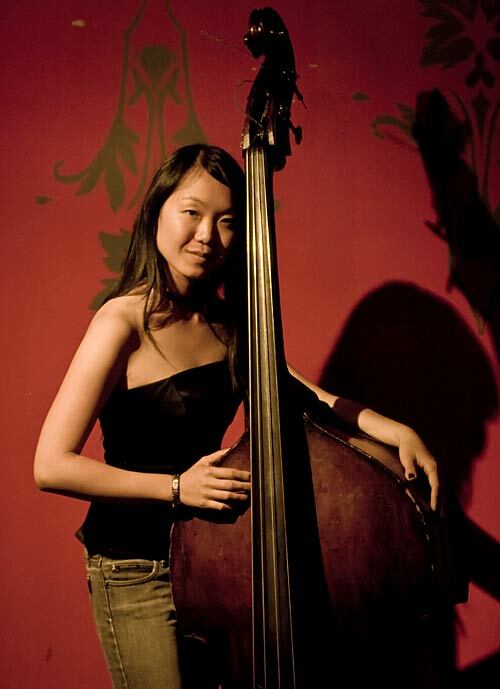 This quartet really works well, and the focus is less on Oh as a skilled young female bassist who has made it to New York (quite an achievement) and more on the creative work of the ensemble. The quartet included some tracks from its forthcoming album Initial Here, due out next year. They played The Ultimate Persona, Something’s Coming (West Side Story), Deeper Than Happy, Little House and No. 1 Hit. There was a very enticing, warm feel to this ensemble. It was polished, with fluid transitions and no jagged edges, exhibiting a group dynamic without any hint that players were seeking the limelight. The band expertly explored a range of moods and emotions. 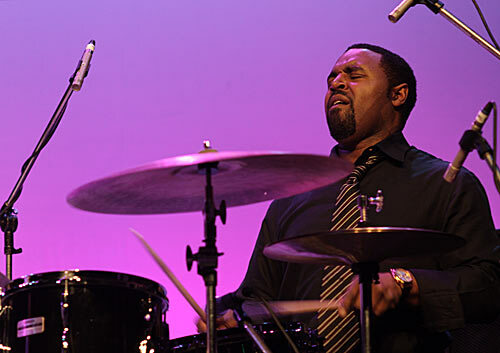 Kendrick Scott on drums was skilled and subtle, not resorting to any smash and bash. Sadigursky contributed some beautiful tenor sax passages and the combination of Almazan on Rhodes with Oh on electric bass guitar worked really well in Deeper Than Happy and Little House. Some who admire Oh’s upright bass skills may have preferred that she stay on that instrument throughout, but the change seemed to allow Almazan more prominence on the weatherbeaten Rhodes and that was no bad thing. Next up, in the WPAC Hall, was pianist/composer Walter Lampe, an expatriate now living in Amsterdam, with Dale Barlow on sax and flute. This was but a brief glimpse of this concert, hardly enough to justify any broad observations. Lampe was alone on stage when I entered, playing sumptious chords. When Barlow returned, he introduced their take on Somewhere Over the Rainbow, which he said would “take all sorts of liberties” with the original, though paying it great respect. St Patrick’s Hall to catch James Muller Trio. Again, this was a brief sojourn just to see what was afoot. Muller on guitar was with Alex Boneham (fresh from his engaging and compelling accompaniment of Geoff Page reading his poetry at the launch of extempore‘s volume of Page’s jazz poems entitled A Sudden Sentence in the Air) and Ben Vanderwal on drums. Apologies for that convoluted parenthesis. These musicians are brimful of talent and this was, I imagine, a set with plenty to offer for fans of robust jazz with some rock influence thrown in. It is a treat to hear Muller in full flight, ably backed by Boneham and Vanderwal, but this was to be a treat for others. I had to catch Josh Roseman with the Australian Art Orchestra. This is where the “wacky” part of the heading of this post starts to make sense. The Australian Art Orchestra can always be expected to come up with something out of the ordinary, so this concert was always likely to be a little different, given Roseman’s taste for similarly thinking outside the square. He is one interesting cat, as they say in jazz milieu. And of course there was expatriate Barney McAll, brother of John McAll of Black Money fame, who is also “out there” in the nicest way. So, who was there and what happened? Well, the laundry list of players was, for the AAO, Tim Wilson and Jamie Oehlers on saxophones, Eugene Ball and Paul Williamson on trumpets, Jordan Murray and James Greening on trombones, Geoff Hughes on guitar, Phillip Rex on double bass and “Mr Grabowsky” (as Roseman always addresses him, with obvious respect) on piano. For the Josh Roseman Unit, Barney McAll played Rhodes, clavinet (electrophonic keyboard instrument manufactured by Hohner, according to Wikipedia), laptop, piano, Chucky (a homemade musical instrument he describes as being “for textural enterprise and underwater landscapes as metaphor”) and maybe another device or two, Ted Poor was on drums and Peter Apfelbaum on drums, keyboards and saxophone. What happened? Well, it is hard to describe, but quite amazing. 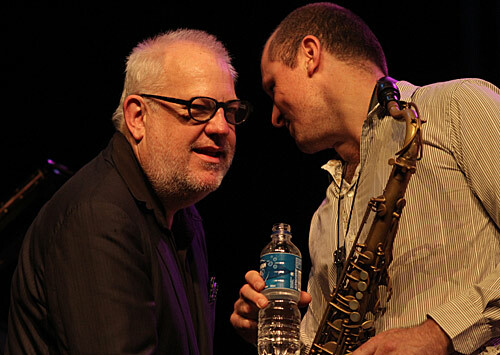 At one point Roseman told the audience that he and Barney had been “ploughing a path through absurdity” for many years, though this was “the first time we have set foot together on a stage in his motherland/fatherland”. Roseman added (and this seems to sum up the night): “He is truly out of a tree and we are going to shake a tree”. And shake a tree they did. But how to describe the result is a challenge. I admit to having been quietly laughing inside on many occasions during the set, because there seemed to be so much absurdist humour built into the performance. Tungsten Mothra (an allusion to a fictional moth monster who is pitted against Godzilla in many Japanese movies) was “dedicated to a lady — a whole lot of them” and was intended (I think) to conjure up visions of cheer leaders. Unspeakable (these were all Roseman compositions), which included a solo by Apfelbaum on melodica, segued into The Execution Tune in an extraordinary multi-layered display, with histrionics, which I was sure featured a fantastic guitar solo by Hughes, but maybe it was produced on the clavinet. It was hard to grasp exactly from whence the sounds originated. McAll pulled enough expressive faces to rival Jim Carrey, as well as leaping about behind his instruments to produce effects or overcome technical difficulties. Manifest Density followed, before Invocation, a work commissioned by the SFJAZZ Collective. This was epic but episodic music, with the structure not that easy to uncover amidst the short interventions by many players and combinations thereof. Contributions were often brief and the overall effect often a busy marketplace of rhythms, textures, patterns and incursions. The set closed with what Roseman described as the King Froopy All Stars theme song, a reference to his 11 or 12-piece big band. This was a sonic feast, with a rich, resonant solo from the bandleader, spiced with some effects. There was a strange, but appealing feel to this piece, with flamboyant piano and keyboards and some piercing “whistles” from Ball’s horn. The musicians were all serious concentration, but the music was laughing. McAll had some fun with effects, producing sounds reminiscent of bird calls. At the end the band went into hymn-like Salvation Army band mode, with Grabowsky really getting into it on piano. Hey, Paul, we could try that in Lost and Found tomorrow morning. I have little doubt that this was challenging music even for these talented musicians, though often lots of fun to play. But it was also challenging for the listeners, because there was little to latch on to before the constantly changing and evolving music moved on. That’s no bad thing, especially in a festival where “really out there” music was not so prevalent in the program. But this fun night did not leave me feeling it was one of the AAO’s highlight performances or that I could walk out with the tag “memorable” embedded in my deteriorating memory bank. It was more music for the intellect than the soul. 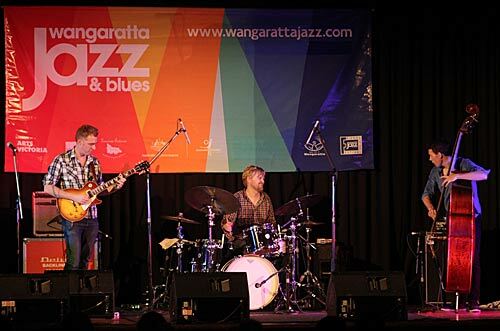 Note: For those who made it this far and intend to return for more on this year’s Wangaratta Festival of Jazz and Blues, I intend posting one overview of Saturday’s concerts, and one of Sunday’s, rather than attempting to review individual performances. These will be posted in the next few days. Please re-visit the blog, because pictures will be added gradually as time permits. 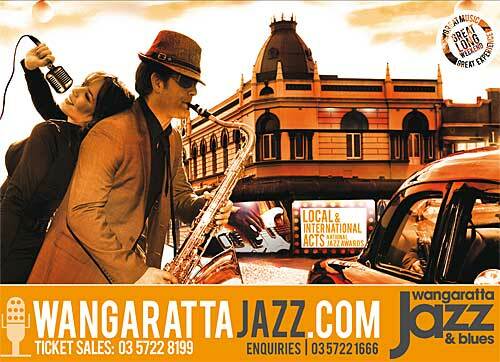 Well, Wangaratta Jazz & Blues is being launched tonight in Wangaratta, but Ausjazz can bring you the bones of the program as artistic director Adrian Jackson is telling the event’s home town denizens what’s in store. 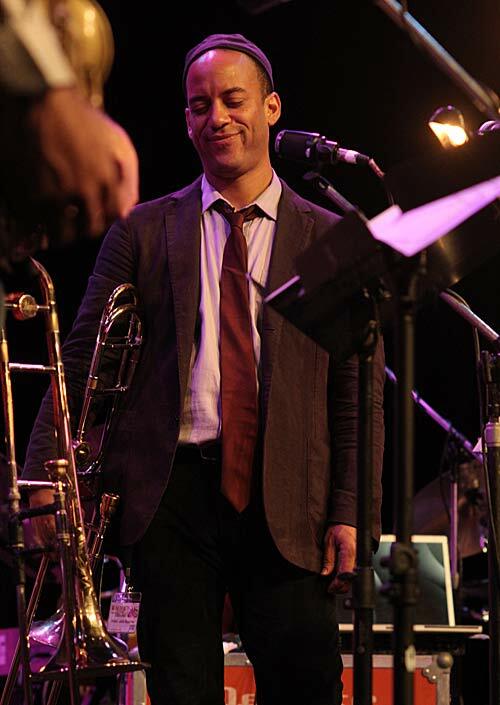 As predicted by Ausjazz blog, American trombonist Josh Roseman is the headline international artist, performing in two concerts with New York band members Australian expatriate pianist Barney McAll, drummer Ted Poor and multi-instrumentalist Peter Apfelbaum on tenor sax, keyboard and percussion. 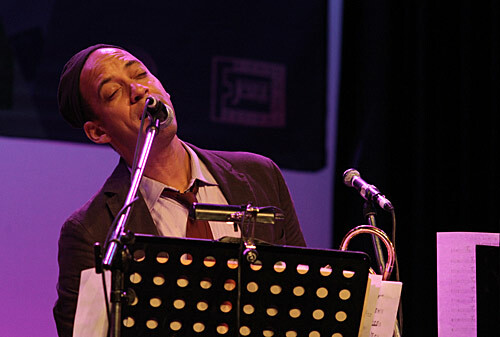 The Josh Roseman Unit has explored “progressive funk, electro and jazz”, and the composer has been described as having “vision” and someone who “plays ideas”. 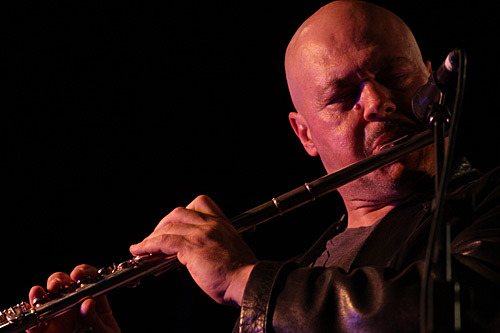 At a media briefing, Jackson revealed that Australian pianist, composer and festival director Paul Grabowsky heard Roseman in New York last year and said he’d like to do something with the young trombonist/composer and the Australian Art Orchestra. That will happen, with Roseman bringing some of his compositions for a 14-piece AAO to explore. 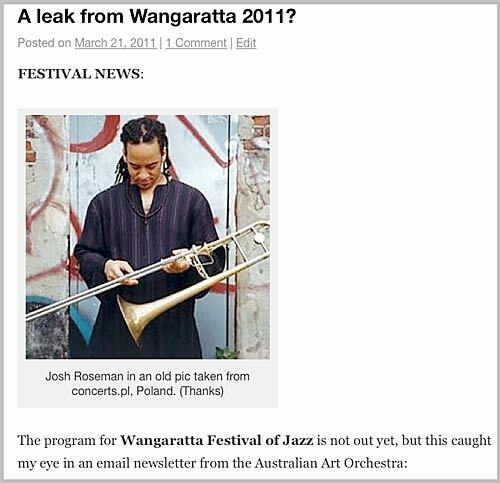 Breaking news: How Ausjazz spilled the beans in the first Wangileak. As well, Barney McAll will unveil a new suite in a premiere performance with two pianos (B. McAll and Andrea Keller), vibraphone and a 16-voice choir led by Gian Slater, who Melburnians will recall for her brilliant commission concert at BMW Edge for the Melbourne Jazz Fringe Festival. This should be a real highlight. 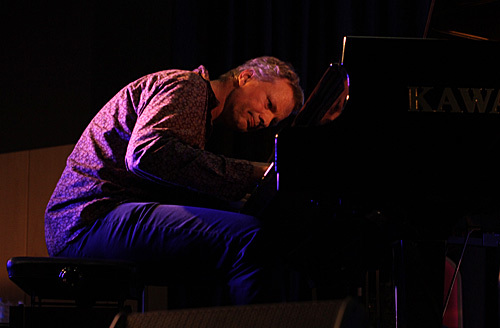 Apfelbaum will also perform a solo piano concert. 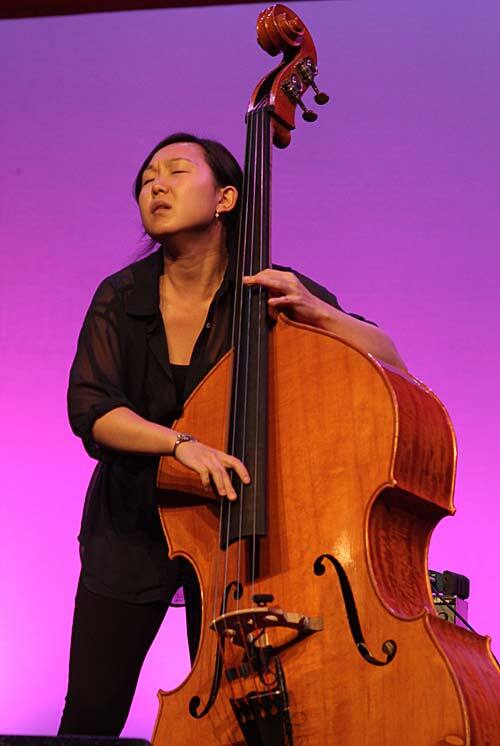 Keeping the expatriate spirit going, Malaysian-born bassist Linda Oh, who grew up in Perth and has since moved to New York, will bring a quartet to Wangaratta to celebrate the launch of her second album. Her line-up has Fabian Almazan on piano, but differs from that on the album, with Sam Sadigursky on tenor sax and Kendrick Scott on drums. Linda Oh featured in April’s DownBeat magazine. 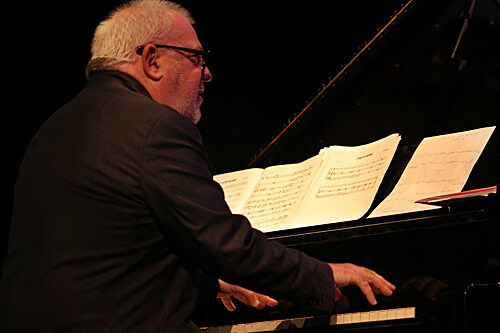 Another expatriate, pianist composer Walter Lampe, will travel from Amsterdam — his home of 20 years — to perform in a trio. I believe Lampe was in Sydney early this year, playing at 505 with Sydney bassist Jonathan Zwartz and former Melburnian, drummer Danny Fischer, but the line-up for Wangaratta will be Zwartz and James Hauptmann on drums. Bright idea: Gian Slater joins Linda Oh in the duet at Bennetts Lane. In a demonstration of just how good Adrian Jackson is at picking up on interesting new combinations, Oh will perform with Gian Slater in a concert of duets for bass and vocals. 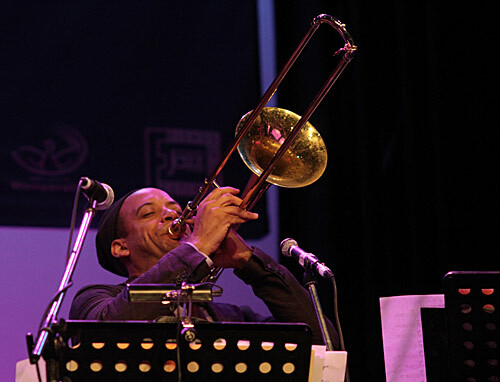 Jackson had the idea when he heard them together at Bennetts Lane during a recent concert with another expatriate, saxophonist Jacam Manricks. 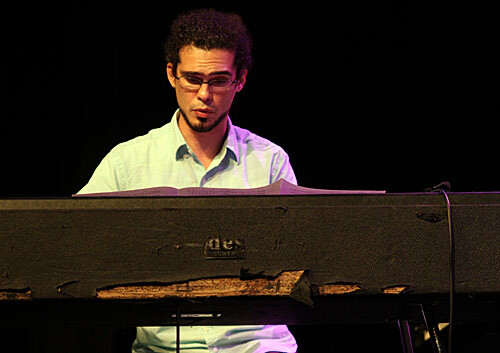 Cuban pianist Almazan, now living in America, has toured the US, South America, Asia and Europe with Terence Blanchard and will come to Wangaratta direct from the release of his first album at the Village Vanguard. Almazan will play with Linda Oh on bass and Rodney Kendrick on drums. 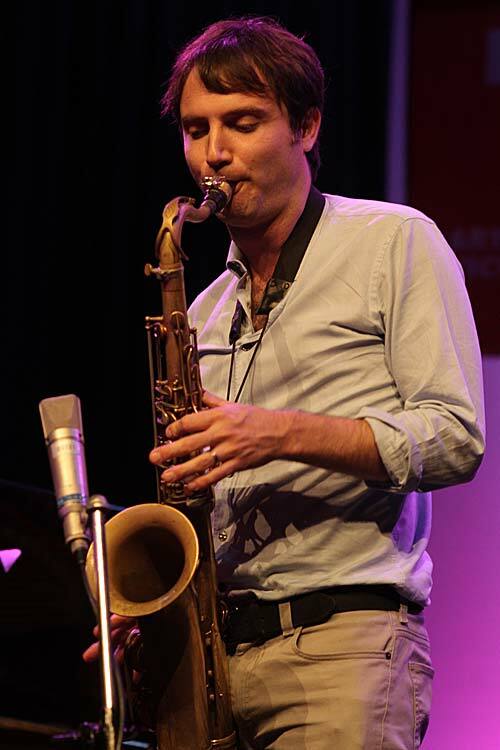 Denis Colin (bass clarinet) from France and Adam Simmons (saxophones etc.) from Australia will join Benjamin Moussay on keyboards and Chander Sardjoe on drums to celebrate their collaboration as La Societe des Antipodes. Headline artist for the blues marquee will be American singer/guitarist Jimmy D Lane, son of Chicago blues great Jimmy Rogers (it’s a stage name). Adrian Jackson said Jimmy D., who grew up with Muddy Waters and Howlin Wolf as regular guests in his house, and listening to Eric Clapton and Jimi Hendrix, is making his first visit to Australia. Others on the blues stage will include the consistently and quietly brilliant Collard Greens & Gravy, Jim Conway’s Big Wheel and Blue Heat. 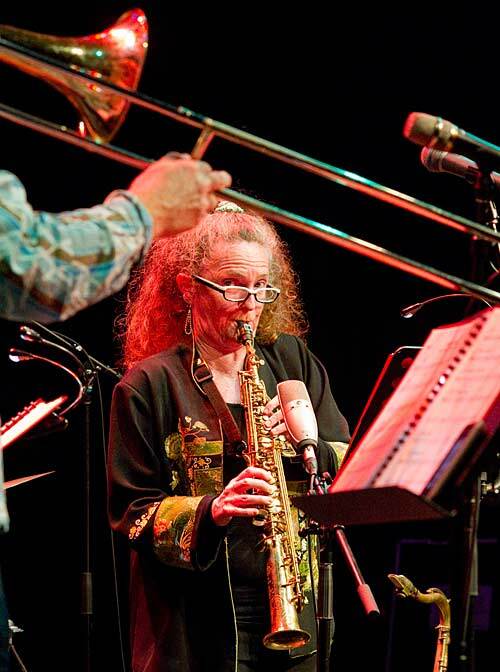 But a blues gig bound to be a huge hit will be saxophonist Paul Williamson’s Hammond Blues Revue, in which Williamson’s usual Hammond Combo line-up will be joined by guests Chris Wilson, Shannon Bourne, vocalist Ella Thompson (who sang at Wangaratta when she was 15) and James Black. Thompson has emerged through the Melbourne Blues Appreciation Society’s Youth in Blues program, which helps young artists. 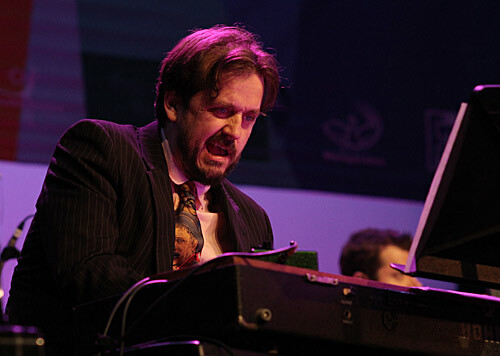 Luckily for anyone who has heard Paul Williamson’s Hammond Combo at Stonnington Jazz (or the Rainbow Hotel), with brilliant Hammond B3 organist Tim Neal and drummer Mike Jordan, the combo will also play a concert in the jazz program. Don’t confuse this with trumpeter Paul Williamson‘s Inside Out (with Marc Hannaford on piano, Sam Zerna on double bass and James McLean on drums), which will be very different. Both gigs are sure to be hits. A later post will cover other festival highlights, such as a new Sandy Evans suite and her duets with Paul Grabowsky, what Allan Browne will get up to with Elliott Dalgleish, and who’s going to judge the National Jazz Awards.